When it comes to youtubers I know people have different opinions on their products but personally I love the products the youtubers I watch bring out. 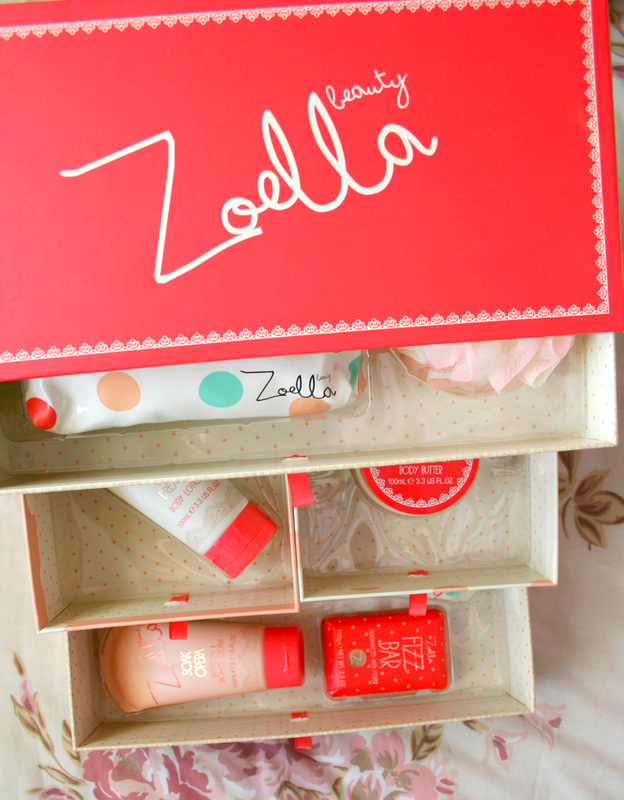 When I seen that Zoe had released a little drawer set full of bath products I knew I had to get it immediately. It was only on the Superdrug website and was costing £50 which was working out at €70 for me. However the day it was released was the day I had to go to the dentist's (worst fear ever) and so I decided to treat myself (even though two hours prior I had treated myself already to some of her new range of products). It arrived on Friday and I was so excited to open up the box and just stare at it because in my opinion it is the prettiest thing i have ever seen. I bought this as I wanted to store my everyday makeup in it rather than buy acrylic storage because the patterns and designs are just so me. Of course I also wanted the products inside too and now I'm 100% sure I don't need to buy anymore bathing products till atleast next year! Getting into what's inside, the first drawer contains a Cosmetic Purse with the words 'too cute' on it which is exactly the words I used to describe it when I took it out. It is a much smaller cosmetic bag than the ones she has released however it's just the right size to carry any essentials you may need to top up during the day such as eyeliner, eyeshadow or lipstick. Also in the top drawer is a Shower Lily which I got a little excited about because I was going out to buy a new one! It's white with pink going through it which is quite cool, kind of like a gradient effect. 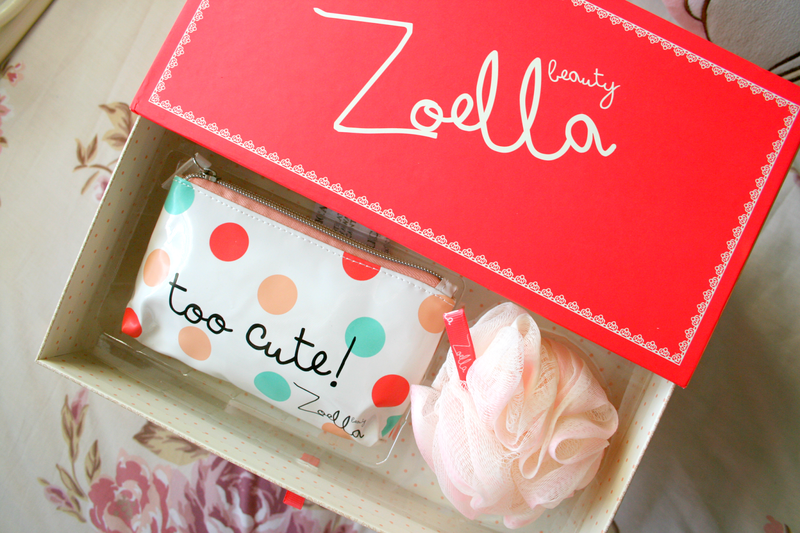 The little hanger attached to it has the Zoella logo on it. In the two middle drawers you get a 100ml bottle of the Creamy Madly Dreamy Body Lotion which I'm excited to try as I didn't buy this from the original line instead I picked up the newest one from her latest collection which I've been loving lately. In the other drawer you get the Butter Me Up Body Butter which I think is just a little exclusive thing to this set as I don't ever recall seeing it before. I am so obsessed with the cute little packaging for the tub it's just so adorable. Finally in the bottom drawer you get the Soak Opera Bath Soak and Shower Cream which is definitely my favourite product from the original range and I've only recently finished my full sized bottle of it so I'm so glad to have some more of it. You also get two Bath Fizzers which sadly I can't use as I only have a shower so I'm not sure what I'll be doing with them yet. Finally you also get a Flowers and Showers Shower Gel which again I think is just a little exclusive to this set. I absolutely love the set as the range all has the scent of the original product line which I loved. I cannot wait to start using the drawers to store my everyday makeup in as it's just such a pretty statement piece. Yes it is expensive I will admit however I do think with the products and the prettiness of the storage case it is worth the price. I'm almost 100% sure that this was released as part of her Christmas collection which you can find on the Superdrug or Feelunique websites! Have you tried any of Zoe's range yet? This looks amazing - I haven't tried anything from Zoe's range but I'm desperate too! This whole set looks amazing! I just love her whole brand and the style of it. I don't really take baths that much (I'm always in a rush so I take showers, eek!) but with her products and whole line in general I really want to focus on taking some more! Those pouches are really so cute! This looks sooo amazing! I really wanna try out some of her new products! This looks so lovely, the packaging is so sweet!